WASHINGTON — On “Face the Nation” with Bob Schieffer, U.S. President Obama said American troops will not be in a combat role. CBS News reported the Obama administration just sent over about 1,500 more American troops to Iraq to help stop ISIS, a terrorist group known as the Islamic State or IS. Obama said this move “signals a new phase” in fighting the terrorist threat in the Middle East, which group has taken parts of territory in Iraq, Syria and encroaching on Turkey and U.S. allies in Kurdistan. The additional 1,500 troops will work to train coalition members in Iraq to help beat back ISIS. 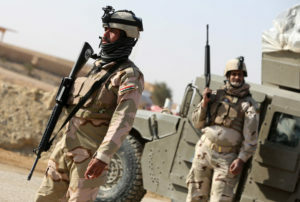 The U.S. will provide air support when the Iraqi soldiers push the terrorists back from their recently-gained territory.